Ornaments are balls. Sphero's a ball. Obviously, Sphero ornaments were meant to be. Whether robotic or not, this holiday season we'd like every ball to remind us of our favorite appcessory, Sphero. That's why we've provided you with an Instructable for creating your own holiday ornaments. For an added bonus to your holiday decorations, we have also included directions for Sphero inspired wreaths. There are countless possibilities when it comes to decorating Sphero-inspired ornaments (almost as many as Sphero has for play), so we wanted to demonstrate a few routes your ornaments could roll to resemble Sphero. One option is to make the sparkliest ornaments on the block. We coated a couple of our ornaments in Elmer's Glue and mixed blue and silver glitter on a plate. Then, we plunged each ornament into the glitter pile and rolled them around until they were fully covered. With blue jewels handy, another option we took was gluing individual gems to one lucky ornament in a random design. Other design techniques we utilized were drawing lines and squiggles with glue and covering with glitter, as well as spelling out "Sphero" with block letters, which were placed on pipe cleaners. 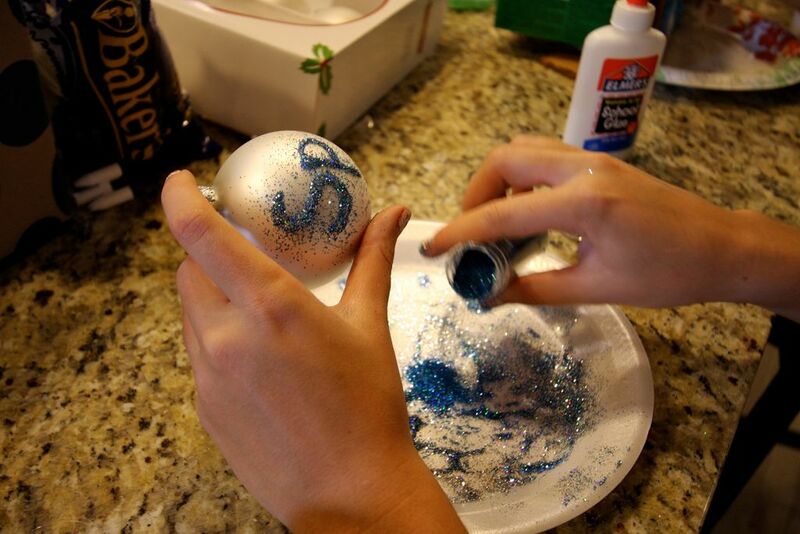 Adding some ribbon details around your ornaments gives them character and spelling out "Sphero" with glitter or gems reminds all of your visitors of your favorite robot. Use a clean, small paint brush to dust off excess glitter. Although wreaths aren't balls, they are round, so we felt the need to give them the Sphero touch too. You can find plain green wreaths at your local craft store along with holiday yarn and ribbon. To begin, wrap both your blue and silver holiday yarn around your wreath and tie a bow with white ribbon to secure the yarn. Now that your wreath is repping Sphero's colors, all it needs is his handsome face. To add his image, shape white pipe cleaners into Sphero's form; add Sphero's eyes with blue pipe cleaners and place each design directly onto your wreath. With your balls decorated and your wreath customized, you can Spheroize your home for the holidays. Now all you have to think about is finding the perfect gift. Hmmm – maybe a robotic ball gaming system? Learn more about Sphero and his 20+ free apps available on both iOS and Android at GoSphero.com. ill try to make a sphero into a star for the tree! Good thinking, Muchen! He'll be the "brightest" star.